1933 Ford 3 Window Coupe Street Rod 426 HEMI. This is the \'KING KONG\' of street rods. The balanced and blueprinted 426 Hemi with a Magnesium Cross Ram intake manifold, dual 780 Holley(3116) carburetors, 700R4 with a 2500 stall is tuned and dialed in to produce 525 hp and 500 ft. lbs. of torque. Many custom made components, as well as a narrowed Ford 9 inch rear end, a TCI frame and independent suspension, coilovers at the corners, Lokar shifter, Wilwood Discs(Electro Hydraulic) at the corners, Moon gauges, Ididit steering column. The car has Power rack and pinion steering, P/B, and cold A/C. A custom Interior and trunk put this build at over 250K. It is a guaranteed show winner wherever you go. 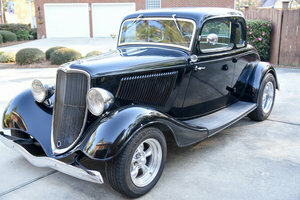 Voted \'Best Street Rod\' at the World of Wheels show. For full component details and build sheet. Please Note The Following **Vehicle Location is at our clients home and Not In Cadillac, Michigan. **We do have a showroom with about 25 cars that is by appointment only **Please Call First and talk to one of our reps at 231-468-2809 EXT 1 ** FREE Consignment Visit Our Site Today Easy To List Your Vehicle and Get it Sold in Record Time.